JNN 14 Jan 2014 Geneva : Iran and six leading world powers, the P5+1, have agreed to implement the nuclear deal reached in Geneva in November starting from January 20. 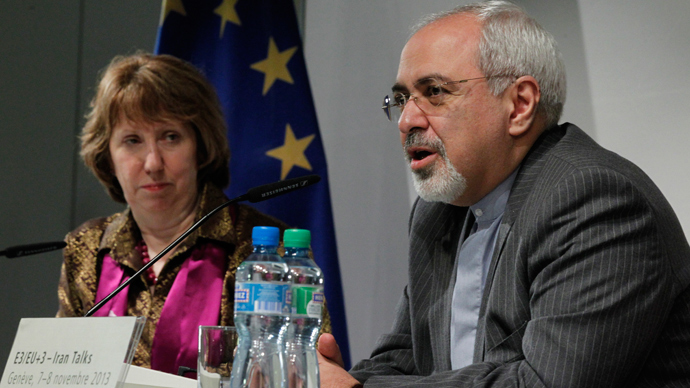 Under the agreement, Tehran receives sanction relief in return for steps to curb its nuclear program. He said the agreement was coordinated with Helga Schmid, deputy of European Union foreign policy chief Catherine Ashton, after the latest expert-level meeting on implementing the Geneva nuclear deal which was concluded on Friday. “This first step is inclusive of a combination of acts that the two sides will have to perform within the period of six months aimed at building trust, so that we will reach the famous final step, or the comprehensive solution,” official IRNA news agency quoted him as saying. “Based on this agreement, they must not impose new unilateral, bilateral or multilateral sanctions against our country, and in return, our nuclear program will not expand quantitatively,” he said. Once Iran begins to implement the Geneva deal, the P5+1 group ( United States, Britain, France, Russia, China plus Germany) will begin to ease sanctions on Tehran, according to Press TV. However, a senior US official said Sunday that Iran will not get all of the sanctions relief until the six-month implementation period ends, Reuters reported. “Access to a portion of these funds will be linked to Iran’s progress in completing the dilution process for 20 percent enriched uranium,” said the official, referring to Iran’s commitment to dilute half of its enriched uranium to no more than 5 percent. According to the official, Iran would receive the first $550 million installment of a total of $4.2 billion in frozen overseas funds on or around February 1. It will be followed by two payments in March, two more in April, one in May, one in June and the last $550 million payment on or around July 20. “We will ask the International Atomic Energy Agency to undertake the necessary nuclear-related monitoring and verification activities,” EU foriegn policy chief Catherine Ashton said Sunday. According to the agreement, “from Jan. 20, the sale-level of Iran’s oil to its customers will be maintained, they won’t reduce the level of oil purchase from Iran, and the United States will not pressure them to reduce their current level of oil deals with the Islamic republic,” Araqchi said. Iran is ready to allow the International Atomic Energy Agency ( IAEA) to verify the implementation of the Geneva deal, he said, adding that delegations from the IAEA will be sent to Iran to prepare the ground for observing the implementation of the interim deal from Jan. 20. About research and development projects in advanced centrifuges, which was one of the points of difference in the expert-level talks, he said that there is no limitation in the Geneva deal about R&D projects and the researches will be continued. Araqch, a deputy for Iran’s foreign minister, said that after implementing the interim deal, negotiations for a final deal with the aim of closing Iran’s nuclear dossier will begin. In November, Iran and the P5+1 group reached an interim agreement whereby Iran would freeze part of its nuclear program in exchange for limited ease of sanctions which had hurt its economy. Following the deal, Iran and the P5+1 group held several rounds of expert-level meetings to study the ways for implementing the landmark agreement. However, Iran’s Foreign Minister Mohammad-Javad Zarif said the talks were advancing slowly and Iran’s Supreme Leader Ayatollah Ali Khamenei blamed the United States with the difficulties on the way of applying the agreement, saying that Tehran’s recent nuclear talks with six world powers revealed the United States’ enmity toward his country. On Dec. 31, Iran and six world powers agreed to start implementing their interim deal on Iran’s nuclear program in “the third 10-day (period) of January,” Hamid Baeidinejad, an expert- level Iranian negotiator, said. On Jan. 10, Araqchi announced that differences between Iran and the world powers over implementing an interim nuclear deal were solved and the ground was prepared for materializing the deal. Russia’s Foreign Minister Sergey Lavrov, who was among the negotiators, said in November that the deal was a win-win situation for everyone. He added that it only became possible after Iran’s president, Hassan Rouhani, came to power in 2013. This entry was posted in America, Europe, United States and tagged Abbas Araqchi, Catherine Ashton, Enriched uranium, Hamid Baeidinejad, IAEA, iran, Mohammad-Javad Zarif, Nuclear Deal, P5+1, Vladimir Putin. Bookmark the permalink.